There are multiple ways to change the Group after the agent has been deployed, either via the PreferencePane on the computer, through the command line (Terminal), or by deploying a Group-Specific pkg. Change the name in the "Group" field. NOTE: Entering the name of a Client Group that doesn't exist will create a new Client Group on the server. The change will be reflected on the server during the agent's next check in. The following command will adjust the Client Group value when used with administrator privileges. 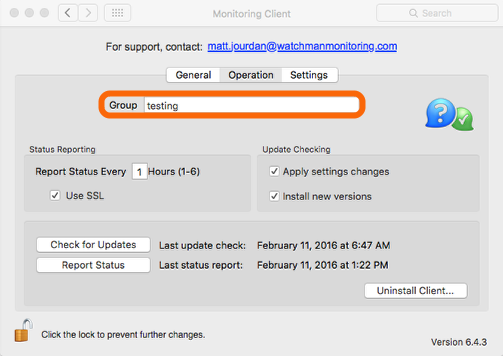 defaults write /Library/MonitoringClient/ClientSettings ClientGroup -string "New_Group_Name"
This is also suitable for use with Apple Remote Desktop, a script in Casper, a saved command in your Bomgar Rep Console, etc. The bundle version of our Monitoring Client installer contains a ClientGroup.txt file. During installation or reinstallation, the contents of the first line of this file are used to set the desired Client Group name. See this article for more info.